Skills relate to different aspects of using language; such as listening, reading, writing or speaking. Skills are our ability to do these things. They are usually divided into two types: receptive and productive. 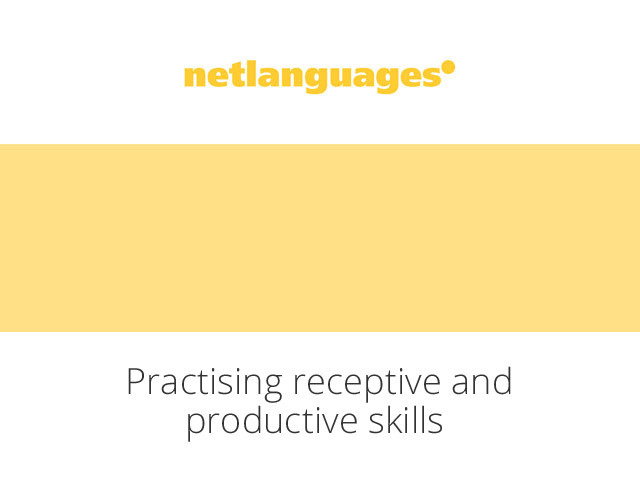 What are receptive and productive skills? Receptive skills are those used in understanding; reading or listening. Productive skills involve producing language; speaking or writing. It is important to consider skills when designing language learning materials. This helps to identify the aims of an activity or lesson. It is generally accepted that receptive skills should come before productive skills; however, it is important to remember that communication is interactive and requires the use of all skills most of the time. Dividing language into skill areas for teaching and evaluation purposes does not necessarily reflect how language is really used. Ideally, learning materials have a multi-layered skills approach, where all skills are covered and combined in a realistic way. How do you create materials that practise all the skills? Well, the way to do this is to think about day-to-day things we do and see how they naturally involve different skills. For example, imagine you are organising a work trip or a social excursion with some friends. Perhaps you first read an email proposing the trip; next, you write a response. Then maybe you speak about the trip or listen to a phone message about a change of plan. You negotiate the details of the trip, either writing or speaking, and then tell someone about your planned trip. During that process you read, write, listen and speak. We can use this model to develop learning materials, linking each activity in the sequence in a logical way. In the following video, you will see a sample from the Net Languages English for International Tourism online course. It shows part of a sequence of exercises designed to practise both receptive and productive skills. Note: Click on “cc” to select subtitles. Each unit of a Net Languages course is designed to incorporate practice of all of the skills needed to communicate in another language, as you can see in this unit outline from the Pre-Elementary (A1) level of the General English online course. When you are asked by a company to provide language skills and mobility preference, what information do you have to provide? Most employers will want proof of a job candidate’s level of English (or other languages) in the various skills, such as writing and speaking. The most effective way of doing this is to provide a certificate from an official exam or a reputable course. The certificate will show the candidate’s CEF (Common European Framework) level or its equivalent. Descriptors of the language skills associated with each level can be found here: http://bit.ly/2z8EbJr. The aim of this blog is to provide useful information on effective online language learning to training managers, pedagogical directors, directors of studies, academic directors, programme coordinators, teachers and learners in general. Net Languages on What are language “skills”? A. Berla on What are language “skills”? Net Languages on How important is your accent when you speak English? Jarod Reekie on How important is your accent when you speak English? Net Languages on How can flash cards be used?